Damn Good Jerky is a brand of Damn Good Foods, Inc., of Stillwater, NY. It's been around since 2000, launched by a guy named Greg Strope, who used to own a floor-cleaning business. He developed an interest in beef jerky, and eventually shifted focus from cleaning floors to selling jerky. In 2006, Damn Good Foods sold 100,000 pounds through convenience stores and its website. I took notice of this brand after seeing reviewers on other websites rave over how good it is. Though it's apparently still more popular on the east coast as it is here on the west. The company makes jerky at their own USDA inspected facility. In addition to this "Original Hickory", I'll have reviews of their "Hawaiian Style Teriyaki" and "Death by Jerky" in the coming weeks. Top round beef, soy sauce, ketchup, brown sugar, worcestershire, natural hickory smoke flavor. The first thing I taste off the surface of these pieces is a light smoky flavor, followed soon by a light sweet flavor. But within seconds of that I can taste a strong saltiness. The combination of soy sauce and worcestershire is easily noticed just from the surface flavors. When I start chewing a piece, I get a stronger dose of the soy sauce and worcestershire. For being labeled as a hickory variety, this jerky seems to provide little smoky flavor. It's only noticeable at that first couple of seconds of putting a piece into my mouth, and even then, it's only the very first piece I eat that I can taste it. Otherwise, the strong saltiness tends to carry over into the subsequent pieces and makes it hard to pick up that hickory smoke flavor. Otherwise, it's the combination of soy sauce and worcestershire that seems to dominate this jerky starting from a few seconds of putting a piece into my mouth, all the way to the end of chewing. 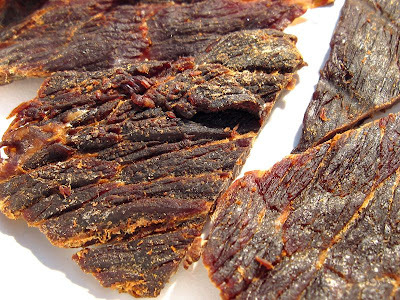 There's lots of this flavor embedded into the jerky that it makes for some enjoyable snacking. Just sucking on a piece yields plenty of soy sauce/worcestershire flavor. The chewing just makes more of that flavor come out. However, in the last few chews before swallowing, the soy sauce and worcestershire seems to wear off, and I'm left with a salty wad of chewed meat. I think the fact that I can taste so much flavor just sucking on a piece, I tend to extract most of it before I start chewing. This is a jerky that lends itself to being sucked on, rather than chewed. As for natural meat flavors, I don't taste any. The worcestershire is heavy enough that I can enjoy its full flavor, detecting the onion and garlic, and even the vinegar, and anchovy. As for that saltiness, it has a high intensity, but it doesn't seem to provide much of a scorch. To sum it, what you're going to taste in these pieces is a light smoky and sweet flavor off the surface, but in only a second or two later, a heavy saltiness erases those flavors, and manifests itself into a strong combination of soy sauce and worcestershire. As soon as you start chewing, the soy sauce and worcestershire increases a little bit more in flavor, but starts wearing off, and leaves you with a salty piece of chewed meat just prior to swallowing. 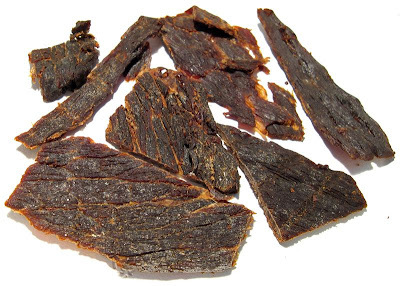 This is a slab style jerky, in slices of whole meat, in a medium thickness, and in small to medium sized pieces. There's also about an ounce of jerky bits in the bottom of the bag. This is a dry jerky, but clearly with a semi-moist, flexible feel. Tearing pieces apart with my fingers seems easy to do, while chewing is mostly easy. The chewing texture starts out with a stiff piece of jerky that has just a bit of rubber-like resistance, but chews down into something meat-like in about 15-20 seconds. It has something of a fibrous, steak-like feel, maybe similar to a medium-well cooked steak. Most every bite I took seemed to contain sinews that left behind unchewable wads of tissue in my mouth. Only a few pieces contained some visible chunks of fat. I didn't really find any with tendon or gristle. For the most part, it seems to be pretty clean eating, with few fragments of meat falling off as I tore pieces apart, and no residue on my fingers. Damn Good Jerky sells all of their jerky varieties from its website at a price of $5.75 for a 3.65oz package. The three packages I bought, plus the shipping of $7.74, brought it to a total of $24.99 for 10.95oz of jerky in all. That works out to a per ounce price of $2.28, putting this into the expensive price range. 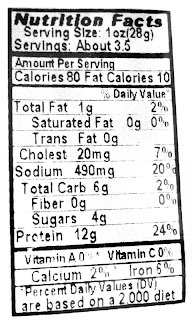 For general jerky snacking purposes, at the $2.28 price per ounce, it seems to present a good value. I'm picking up a lot of snackability for its strong flavor intensity, good overall flavor, good chewing texture, and easy eating. If you can find this jerky at a store, and not have to pay the shipping, I think it provides an excellent value. For being billed as a hickory variety, at the same $2.28 price per ounce, it seems to be a weak value. I only get a bit of smoky flavor in the first one or two seconds of putting a piece into my mouth, which is then erased by a strong salty flavor. If you're looking to spend money on a hickory flavored jerky, I don't think you're going to get it here. I'm giving this a good rating. This Original Hickory variety from Damn Good Jerky seems to provide a lot of snackability through a strong flavor intensity that belts out a burst of saltiness from the surface which parts way to a strong dose of soy sauce and worcestershire. It's a jerky that seems to lend itself to being sucked on more than being chewed. But while those flavors will impress and awaken your senses, I still wanted to taste some natural meat flavors, but didn't get any. I also grew a little weary of nearly every piece containing unchewable sinews. There's also the fact that about a full ounce of this jerky is in the form of small bits that require you to pour them into your hand to eat. I'd rather have a piece large enough for at least a whole bite. But overall, I think this Original Hickory variety is "damn good jerky"; it's just not quite "damn best". I'd recommend drinking a smoked porter to go along with this. I had been doing a look up of differant jerkies and came across this site and one other, www.beefjerkyland.com which has less then Best Beef Jerky.org but any way any information is always helpful in any online purchase. I wish my wife would have came across this site and www.beefjerkyland.com and read the reviews on this brand but she bought this jerky for me as a surprise how can I be mad at her! My wife purchased 2 bags of Damn Good Beef Jerky for me because of the name and I was very disapointed that it wasn't that DAM Good! The salt was so overpowering I could not even finish eating it. I hate throwing away money!! Don't waste your money on this DAM jerky! This stuff is simply amazing..